Subscribe now and get free printable posters and other cool perks! DON'T MISS OUT OUR SALE! • Super Sale Bundles up to 50% off! PLANT-BASED TIPS, VEGAN RECIPES, INTERESTING NUTRITIONAL INFORMATION AND LOTS OF FUN! YOUR ULTIMATE GUIDE TO A SIMPLE HAPPY PLANT-BASED LIFESTYLE! Join Pedro Almondovar (a roasted almond) as he takes you through the wonderful world of vegan nutrition, helping you take the first steps to a better, healthier, nutrient-filled, compassionate lifestyle. The book takes boring, hard to understand research, that can sometimes feel overwhelming, and breaks it down using cheerful visuals, making it a fun vegan guide. Whether you’re just curious, want to transition to this lifestyle, or are already there and just want to know more, this book is made for you. take a look inside it! Using the following guides for Iron, Protein and Calcium Sources, you can easily meet all of your nutritional needs on a plant-based diet. A well-planned vegan diet is rich in vitamins, minerals, good fats, fiber and a healthy intake of proteins and carbohydrates. This powerful diet offers numerous health benefits including lowered risk of heart disease, type 2 diabetes, and obesity. New to veganism? Worried about giving up your favorite desserts? Don’t panic. You don’t need eggs to make delicious recipes. Eggs are used for binding, moisturizing and thickening. Many vegan ingredients easily perform these tasks. Use our simple guide to enjoy baking and cooking without eggs! Our vegan plate guide is a helpful resource for those just starting the vegan lifestyle. Based on 5 food groups, it’s the perfect diet planning aid. Want to know what vegans eat? vegan newbies will gain a greater understanding of the nutritional aspects of the diet and learn what is needed to maintain this healthy lifestyle. The information now available makes the transition to a healthier diet easier than ever. You’ll discover that becoming a vegan and achieving an overall improvement to your health is easy – and delicious! DISCOVER THE RICHNESS OF THE SUPERFOODS YOU ALREADY EAT! Though they aren’t legally or medically defined, “superfoods” are nutrient powerhouses that deliver mega-doses of antioxidants, vitamins, polyphenols and minerals. Eating them offers multiple health benefits. Consumers of superfoods are healthier and thinner, and eating these powerhouses may reduce your risk of chronic disease and prolong your life. Learn about common plant-based superfoods and their health benefits from our superfoods guide. How do humans affect the environment? Eliminating meat, dairy and eggs from our diet could prevent several million deaths by 2050. It could cut global-warming emissions significantly and save billions in annual healthcare costs. HI! I’m Miki Mottes, illustrator and designer. I’m most passionate about two things. I love all animals. I love most plant-based food (fennel tastes weird…) My goal is to use my design abilities to promote the values I believe in, and I am dedicating my life to do so. Prior to this project, I have volunteered my talents for many great causes, including: Educational materials for the Freedom Farm Sanctuary, Illustrated materials for ‘Meatless Monday’ organization, Illustrations for SPCA and another animal welfare organizations, Illustrated interior design for a hospital’s pediatric department. 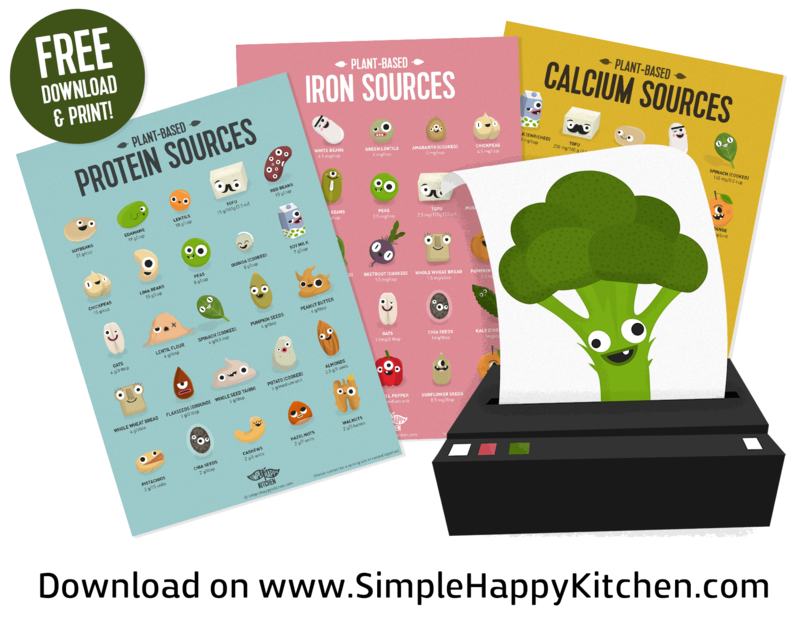 My current ambition is to use my illustrations to promote plant-based nutrition with Simple Happy Kitchen. This happy project is based on reliable resources and research, to bring you the very best in vegan living. All nutrition information is verified and approved by vegan nutritionist BSc Tal Porat. 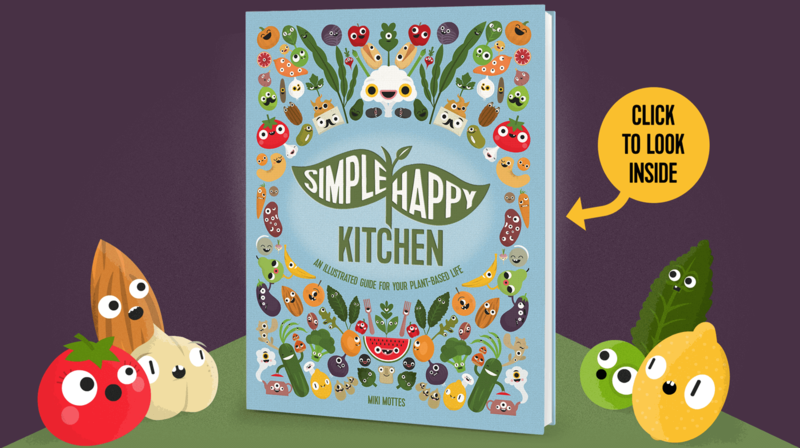 The Simple Happy Kitchen Shop is Live! After the success of the vegan Kickstarter campaign and the on-going requests of our dear fans, we decided to go ahead and launch the store.